Cook beef, onion and bell pepper in Dutch oven over medium-high heat about 6 minutes, stirring occasionally, until beef is brown; drain. Stir in remaining ingredients except cheese. Heat to boiling, stirring occasionally; reduce heat to low. Simmer uncovered 10 to 12 minutes or until pasta is tender. Sprinkle with cheese. 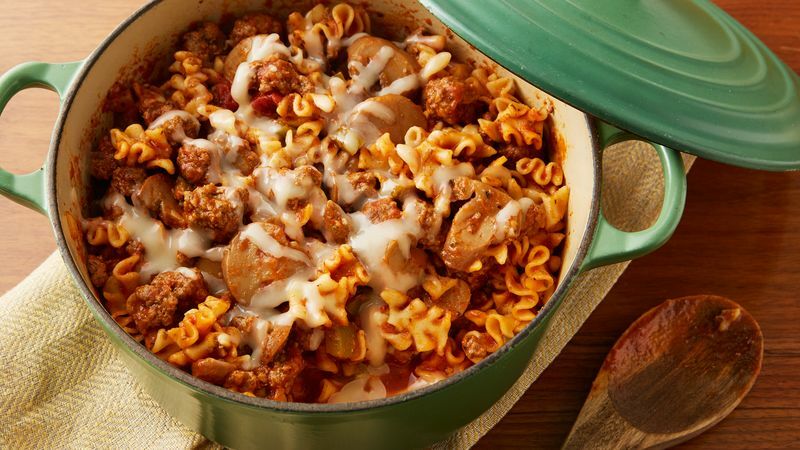 Break up lasagna noodles or use pieces that are already broken instead of the mafalda pasta in this savory weeknight favorite. If you're out of mozzarella but still want a cheesy experience, you can use shredded Parmesan, Asiago or Monterey Jack cheese instead.